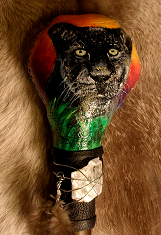 By the artist "Moon Cat", the Black Jaguar Rattle embodies the energy of the Black Jaguar medicine. 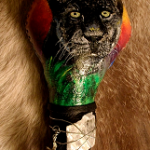 The Black Jaguar Medicine is the teacher of personal power, strength and stealth. With the Black Jaguar as your guide, you will navigate the jungles of life with clarity and confidence. This Rattle is made from rawhide and contains organic corn, selenite and clear quartz crystal within it. It also has leather, a small feather and a selenite crystal mounted on the handle of it.